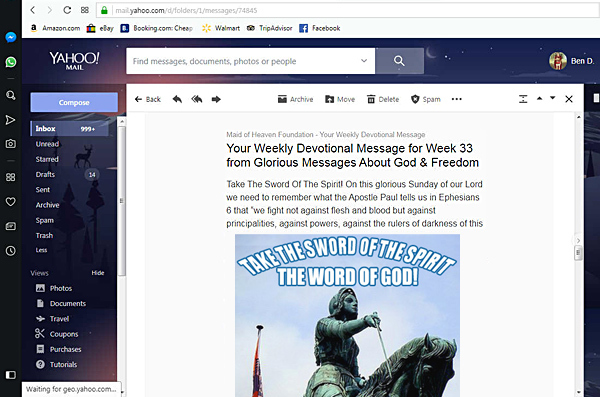 Any personal information that you provide to us will ONLY be used to send you the weekly devotional message that you can find HERE ONLINE or to contact you with other important messages about the Maid of Heaven Foundation like our yearly Freedom Leadership Conference or other resources we have that may be of interest to you. We do not share, trade or sell any information that you provide to us and will ONLY use your information to help you derive the greatest benefit from the resources available through The Maid of Heaven Foundation. If you decide you no longer wish to receive email messages from us you need only respond to our email message with the word REMOVE and you will be deleted from our list of contacts.